Bad North is a charming but brutal real-time tactics roguelite game from Plausible Concept. 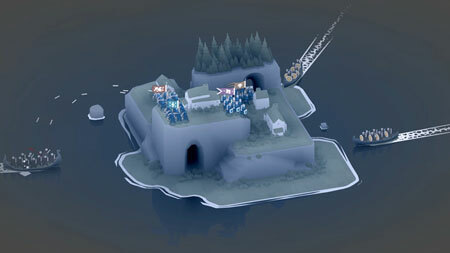 Defend your idyllic island kingdom against a horde of Viking invaders, as you lead the desperate exodus of your people. Command your loyal subjects to take full tactical advantage of the unique shape of each island. Your home is under attack. As you rise to take your father’s place as ruler, it will fall to you to stage your defenses. This is no fight for victory, but a desperate grasp for survival. It’s charmingly brutal, with beautiful procedurally-generated islands and adorable soldiers juxtaposed against the blood-stained realities of war. You control the broad strokes of the battle, giving high level commands to your soldiers who try their best to carry them out in the heat of the moment. Position and relocate your troops to fend off the Vikings, who each have their own counters to the threats you pose. Pick your battles and plan your evacuations carefully. Lose a commander and they’re gone forever. If you get stuck in the game, check out the video walkthrough and gameplay for the game. This entry was posted in PC Games, Walkthrough and tagged Bad North Cheats, Bad North Game, Bad North Gameplay, Bad North Guide, Bad North Hints, Bad North Review, Bad North Solutions, Bad North Strategy, Bad North Tips, Bad North Walkthrough by Marvin. Bookmark the permalink.